A friend and I fished a backcountry lake last summer. To reach it we had to hike a quarter mile or so through a grassy field. Unfortunately, the fish didn’t cooperate. But when we arrived back at the truck, I did notice another creature. A tick was crawling up my fishing buddy’s neck. “There’s nothing good about ticks,” I said as I showed him the little blood-sucking parasite. We are indeed fortunate that ticks are small because these arachnids are like little vampires. They bite unlucky humans who cross paths with them and then make a meal of their blood. A tick the size of Gentle Ben would certainly be frightening to encounter. The same holds true for mosquitoes and chiggers. We can be thankful they don’t get very big and their bites are usually just an itchy inconvenience. This is not always the case, however. A number of infectious diseases are transmitted by these biting bugs. And left untreated, some illnesses such as Rocky Mountain spotted fever, tularemia and Lyme disease can be dangerous or even deadly. It is important, therefore, that we learn proper methods for avoiding bites whenever we’re outdoors. You also can purchase permethrin-treated clothing from companies like L.L.Bean and Insect Shield. Researchers at the Centers for Disease Control and Prevention (CDC) conducted a recent study that found just a minute or two of contact with permethrin-treated clothing caused ticks to become incapacitated or fall off fabric. The clothing could potentially keep ticks from getting beneath clothing and staying next to skin long enough to bite. Attached ticks should be removed properly to avoid infection. Refer to the CDC guide for doing this correctly. To avoid mosquito bites, wear protective clothing outdoors and use insect repellents containing 15 to 30 percent DEET. These include Tender Corporation’s Ben’s 30, S.C. Johnson’s Off! and Spectrum Brands’ Cutter. DEET (a.k.a. N,N-diethyl-m-toluamide) has been the world’s most widely used insect repellent for more than 60 years and remains the most effective repellent available. Another great tool for combating mosquitoes is the ThermoCELL from Schawbel Corporation. Each ThermaCELL unit operates on a butane cartridge that heats a mat and releases insect repellent into the air, creating a 15-by-15-foot, bug-free area. These small units are portable and odor-free, ideal for use when fishing and camping. No matter how much you try to steer clear of them, outdoor pests are here to stay. Because of them, infants will wail, women will weep and strong men will teeter on the brink of madness. Fortunately for you, my body parts are preferred by nine out of 10 biting bugs in North America. Could you scratch my back, please? A little lower. Yeah, right there. 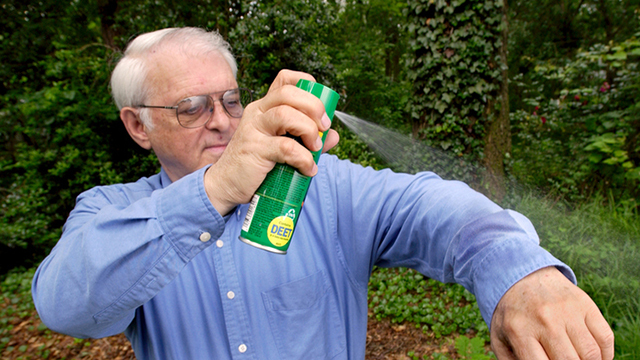 Keep repellents away from eyes, nostrils and lips; do not inhale or ingest repellents or get them into the eyes. Avoid applying high-concentration (>30% DEET) products to the skin, particularly of children. Avoid applying repellents to portions of children’s hands that are likely to have contact with eyes or mouth. Pregnant and nursing women should minimize use of repellents. Use repellent sparingly; one application will last approximately 4-6 hours. Saturation does not increase efficacy. Wash repellent-treated skin after coming indoors. If a suspected reaction to insect repellents occurs, wash treated skin, and call a physician. Take the repellent container to the physician.